﻿ Originally from Liverpool, but now located in Manchester, Counterpoint are causing a stir with their sound. Formed from the remains of their old band, Operation: AEON, vocalist Dominic Lucock and guitarist Martin O’Neil formed Counterpoint in 2015, wanting to create a sound that pitched 2000s alt-metal with a modern-day vibe. The first track on the EP, Leave It All Behind, provides a short insight into the band’s sound – at just over two minutes long. The track opens with fast paced, heavily distorted guitars which then falls seamlessly into a slower rhythm before the verse begins. The vocalist Dominic displays his abilities to perform edgier vocals in the verse with cleaner on the chorus. However, the lyrics do appear to get slightly lost in the mix. The following track Honestly has much more substance with alternations of instrumentation levels. The track begins with a synth build up and heavy guitars before reducing to vocals and clean guitar melodies in the verse. This track appears to display a greater musical ability from the group than the opening track. Between You And Me has an interesting opening rhythm with staccato chords mixed with continuous strumming. The synth melody in the verse adds an extra dimension to the track alongside, the vocals which have a filtered effect. The track also contains a pre-chorus breakdown not dissimilar in tone to the sound of some Slipknot tracks. This contrasts with the clean vocals in the chorus. The fourth track on the EP DownDownDown, has a dramatic intro of heavy guitar chords, before reducing to a cleaner melody accompanying the vocals. The chorus does not have quite the heavy tone of the verses, but involves fast guitar rhythms and full sounding back vocals to the main vocal melody line. The final track is One Sided Conversations. A clean guitar melody begins with group vocals, followed by guitar chords with a build up to the powerful chorus. The second verse begins with the same clean guitar melody then introduces distorted guitar chords halfway through leading to the next chorus. The track ends with a build-up of distorted guitars and percussion, that may appear slightly unfinished but certainly adds something extra and unexpected. This EP displays that Counterpoint have good songwriting skills with their ability to alternate instrumental layers in the tracks. This is a good opening EP and the band certainly have potential which will hopefully be displayed in future works. 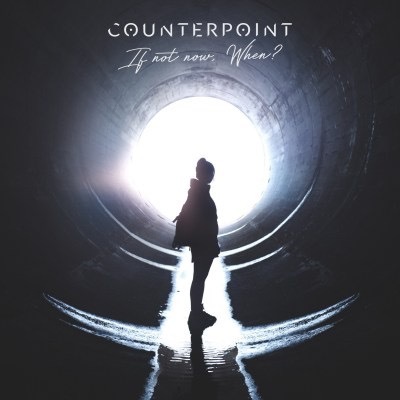 ‘If Not Now, When?’ by Counterpoint is released on 9th February.